Rob Chapman calls limited-edition model a product of "collaborative sourcing." Chapman has announced the new ML3 Pro Semi Hollow Obsidian Burst guitar, available at Guitar Center beginning today, November 23. The new model is the second Chapman semi-hollow guitar, and will only be available at Guitar Center stores for a limited time. Rob Chapman’s 670,000 YouTube subscribers as well as Guitar Center customers were invited to vote on all key design elements of this unique guitar, a process Rob Chapman calls “collaborative sourcing” to design guitars to fit the needs and interests of musicians. Rob Chapman based the guitar’s design on the existing ML3 Pro Modern. To help create the guitar, customers visited the Chapman Guitars website and voted on specifications that included special humbucker pickups and a flame maple Obsidian Burst finish as part of the guitar’s feature set. The Guitar Center exclusive instrument features a reverse headstock, flame maple top, thick carved maple cap, mahogany body, stainless steel frets, and a baked maple neck. Other features include dual Chapman Madrigal humbuckers with coil splits, a 5-way switch, a 648mm (approx. 25.5 inches) scale length, Hipshot Grip-Lock Open (18:1 Gearing) tuners and a Chapman String Through hardtail bridge with brass saddles. 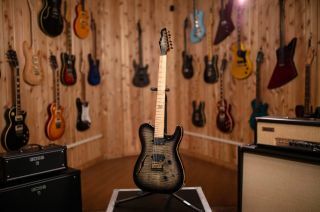 During Guitar Center’s recent Guitar-A-Thon celebration, Chapman introduced its first Guitar Center-exclusive Chapman ML3 Pro Semi Hollow Electric Guitar, which was a similar design to the new Black Friday model but featured P90 pickups and Honey Burst finish. For more information head over to guitarcenter.com.